In The Second Machine Age – Work, Progress, and Prosperity in a Time of Brilliant Technologies (W.W.Norton, 2014) MIT Professors Erik Brynjolfsson and Andrew McAfee are showcasing the way technologies are shaping the landscape of science, economy and society and they’re revealing the forces that lead the changes in our lives and works. In the first part of the book the fundamental characteristics of this Second Machine Age are being described. Several examples from the recent advances in technology that seem to come directly from a sci-fi movie are being presented and the authors are discussing why we should be certain that in the future the scale and the pace of innovation in Computers, Robotics and other digital technologies can only but to be realised. In the second part, the authors are exploring abundance and inequality - two of the economic consequences of this era - while in the third part they are examining which are appropriate and effective for our times. Brynjolfsson and McAfee’s The Second Machine Age was recently published in greek for the first time by Kritiki Publishing with pretext and translation from Giorgos Nathanail. 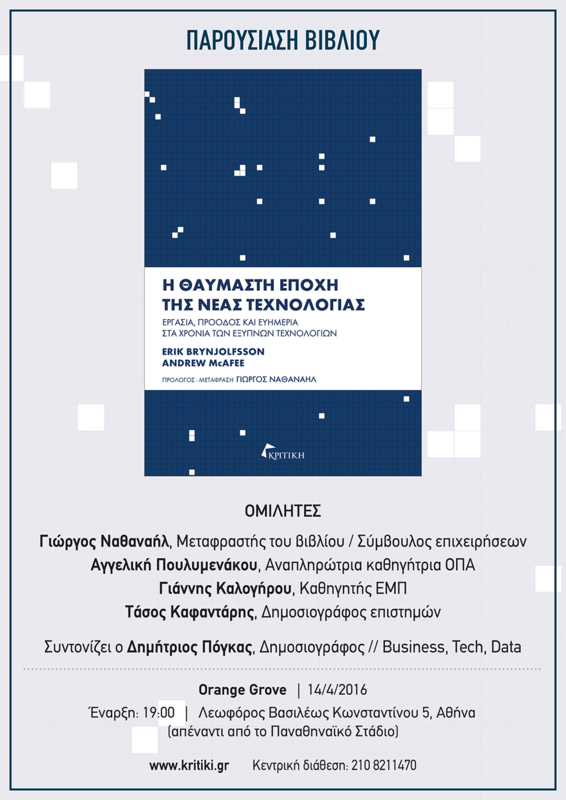 I have been invited to host the book presentation and moderate a discussion on its key ideas and findings, joining Giorgos Nathanail, business consultant, Angeliki Poulimenakou, Associate Professor at the Athens University of Economics and Businees, Giannis Kalogirou, Professor at National Technical University of Athens, and Tasos Kafantaris, Science Editor. The Second Machine Age will be presented to the greek audience on Thursday, April 14th, at 19:00, at Orange Grove (Leoforos Vasileos Konstantinou 5, Athens). You can indicate your attendance by joining the presentation’s FB event here.